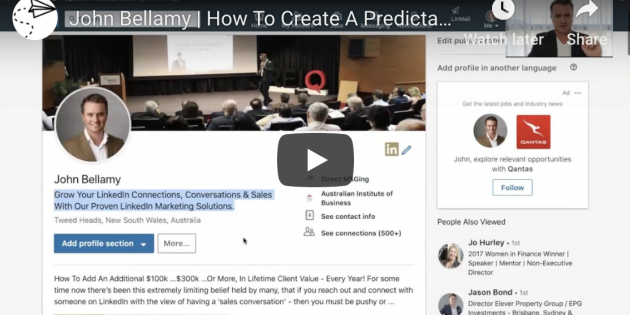 In this video, John Bellamy shares how you can turn LinkedIn into a predictable marketing and sales machine. Whether you’re looking to enhance your b2b lead generation strategies …or… simply to increase your brand recognition and authority – LinkedIn is where you need to be. In this training we discuss. If you like what I have to say and want to learn how to use LinkedIn to get more brand exposure – drive me b2b lead generation and close more sales, then go here: https://directmsging.com/call and schedule a call – no charge. my shout. First, we get on a video conference (we use Zoom), and go over your business. I’ll take a look at what resources you already have in place, what you’re actively doing now (marketing and sales), and what you want to achieve moving forward. Once we have clear understanding of where you’re at – I’ll help you come up with a plan of action to immediately increase the effectiveness of your marketing – More sales. More profit. And, assuming you’re happy and you want my team and I to help you implement a marketing a sales machine – that consistently produces more sales (and profits), you’ll probably want to continue working together long-term. Like I said, there is no charge for this.